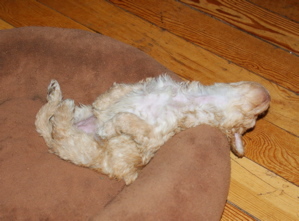 This little Australian Labradoodle has had a hard day of playing and growing. Angelica, the miniature Australian Labradoodle was designed to be a non-shedding family companion. He doesn’t know it but he was born by design and is now in a family where he fits in with every member of the family and doesn’t shed hair on the furniture. It is a safe bet that every breed you have come across is a ‘designer’ dog. The only dogs we meet who are not ‘designer’ dogs are dogs who have parents who chose their own mate. There are two schools of thought about dog origins. One is that they descended from wolves. The other is that they were always dogs but they looked very like wolves and behaved very like wolves. One study showed only a one percent difference between dog and wolf dna. People by their breeding practices designed every dog we know to suit their needs. It seems for most of them a wolf just didn’t make the cut. The wealthy designed mastiffs to guard their property and hounds to help them hunt. The farmers designed terriers to kill vermin. People have used two methods to design their canine companions. Most breeds have come a long way from the wolves so we must be doing something right. If a breeder wants a small dog they simply breed the smallest dogs they have until the offspring were generally small. However, Liz did have Buddy the 15 pounds Yorkshire Terrier who came from 8 and 5 pound parents so you never can be too sure. The other way is to cross two existing breeds with characteristics that you like. In the Australian Labradoodle the Labrador Retriever was chosen for his strength and work ethic and the poodle for his cleverness and non-shedding coat. There is also the faithful Spaniel in the foundation of the Australian Labradoodle. According to some people if the cross in new it must be a mutt. Many people instantly loved the doodle for her friendliness and non-shedding qualities. Others thought we had enough breeds already and should stop making a fuss over an expensive cross breed. What these people perhaps forget is the all of the dogs that are the result of successful crosses. The Whippet was a cross between the Greyhound and small terriers, most notably the Bedlington Terrier. The only difference between the Whippet’s history and the Australian Labradoodle is 120 years. The Yorkshire Terrier has his roots in the Paisley, Manchester and Clydesdale Terriers. The Yorkshire has been around such a long time we call him a Yorkie not a mutt. When is a Cross Breed No Longer a Cross Breed? The breeders at the beginning have a vision, do the work and then wait for many generations for the breed to be recognized. New dog breeds are recognized by the Canadian and American Kennel Clubs on a regular basis. 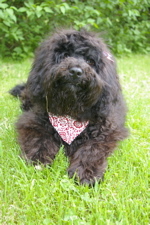 The Black Russian Terrier is a cross between a Rottweiler a Giant Schnauzer and an Airedale Terrier. They were bred in the 1930 by the Russian Army and finally recognized by the American Kennel Club in 2001. The International Australian Labradoodle Association and the sister organization the Australian Labradoodle Association are working to have the Australian Labradoodle recognized by the Australian Kennel Club. What Is Your Pet Designed To Be? The Black Russian was designed as an athletic guard dog. This is perfect for the castle owner or an army needing a working dog. Before you choose a dog find out his original purpose because it will be in his genetic makeup to be true to his design. I found out long after our darling Yorkies were in doggie heaven that the Yorkie was not only bred to be tenacious and follow those rats into the hole underground but he was bred to do it while barking. Somebody had designed a dog with a nonstop bark! This was to help the farmer know just where she was while she in the tunnels below the barn. Even though an American Pit Bull may never have seen a pit and is loving and friendly it is entirely possible that the sun may glint on the neighbour’s beagle a certain way and the beloved ‘Pitty’ will remember the job her genetics call her to do. 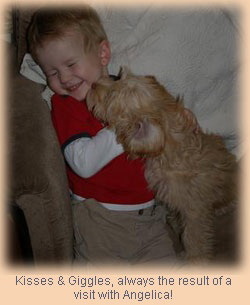 The Australian Labradoodle was bred to be an allergy friendly dog that would make a suitable companion and assistant to people with disabilities. She is loving and helpful by design. She also has water dog in her genetic map and so most Labradoodles enjoy a swim. She was bred to relate easily to people and not be a ‘one man dog’ making her ideally suited for family life. If you live with chickens make sure she is used to leaving them alone as a pup because in that sweet doodle there are the genes of a fine bird dog.